It’s National Book Lovers Day! I know what you’re thinking — that’s basically every day, right? But, with things being... well, the way they are, it’s more important than ever to bring the focus back into one of the best lines of defense we have against oppression, prejudices, and violence. Books and stories might not have the power to stop bullets and create vaccines, but they can help create and shape the people who will one day have the power do those things. After all, several studies showed that millennials who read Harry Potter as children were less likely to vote for Trump than those who had not. Stories like Harry Potter focus on revealing people for who they are — not what fear or prejudice makes them out to be. So, to honor the books of youth and to do my part in spreading literacy awareness, I’ve put together a list of the books that changed my life in some bombastic, and some surprising, ways. This is first on my list because it is first on any list in my life (even my grocery list). I’d hazard to say this was easily the most important book I’ve ever picked up. I first read it in 9th grade because 9th Grade Honors English said I had to. But the person who picked up that book for the first time and the person who put it down when she was finished were two different people. What helped a great deal was having a teacher who was so enamored with the book and had read it so many times that she was able to recite passages by heart. It was one of the few times in life that I knew exactly how and when I’d be able to use something I was taught in a high school classroom. It is a sin to kill a mockingbird. You knew this one was coming next. Fun fact about why I started reading it in the first place: The year is 1999 and one my mother asked me (likely while I wore some sort of denim overall ensemble) if I liked the Harry Potter books by J.K. Rowling. Me, thinking she was referring to Beatrix Potter (because seven-year old Mel) said “yeah, sure.” I was handed the first three books — the only ones out at the time — and nothing was the same after that. In fact, I still have a smudge on the first page of Sorcerer’s Stone where a bug crawled on it and met an untimely, but textually rich, demise in my backyard tent. You don’t need another twenty-something telling you how important Harry Potter was for an entire generation or how unique the experience was. We know that. What last year's election from hell revealed was how much those kids reading by flashlight in the backyard learned from seven books that they grew up alongside. It’s a children’s story full of hate, genocide, government propaganda, intolerance, and segregation. By the time Trump appeared with his scapegoating, arrogance, and general contempt for anyone who wasn’t him, we’d seen it all already. Because the truth is that Harry Potter is as much a story about protecting, loving each other, and treating each other as human beings as it is about a boy at a wizarding boarding school. After all, the only reason Voldemort was not able to murder an infant child was because an act of pure love and sacrifice shielded him. That might not work in our world, but that doesn’t mean we can’t try. I didn’t start reading these until after I stumbled upon watching the first movie. I distinctly remember hiding behind my couch when the Ring Wraiths came on screen because I was convinced they could see me. Since then, I’ve read as much in Tolkien's universe as possible and learned that the magic box in the living room isn’t actually real. Lord of the Rings has its obvious place in our world: the modern-day staple and bar for high fantasy, the linguistic major’s paradise, and New Zealand’s claim to fame. But there’s much more going on beneath Lord of the Ring’s Dwarf and Elf populated surface. At its most basic level, Lord of the Rings is about survival, and what groups of beings will do to ensure their survival. We could choose to be like the Elves, who abandon Middle-earth to its doom and exercise their divine privilege of immortality to sail far away to the Undying Lands. We could be like the race of Men, fractured and divided, with some on the frontlines, losing a terrible war while others pretend to not see the struggle of their fellow people. We could be like the Ents who see the damage and hold conferences on what to do, ultimately deciding to stay out of a conflict. We could be like the Hobbits, blissfully unaware of danger until it’s too late. I also may or may not have an Elvish (Qenya) poem tattoo (I do). This is one that has stuck with me for years, and I’ve managed to collect several copies of it over the years. This is another story we all know well: a mad scientist, in his arrogance, creates life from nothing and then abandons it, attempting to pretend it never happened and said life is not having any of it. The Creature is such a unique character in literature, serving as a traditional boogeyman villain while being one of the most sympathetic and sorrowful people out there. He’s rife with existential quotes (“I ought to be thy Adam but, rather, I am the fall angel”) and a childish need for both vengeance against the his creator and love from the closest thing he has to a parent. It’s a cautionary tale on the dangers of arrogance and irresponsible science, it’s also an introspective story on what makes us human — and all that mortal coil jazz. After all, the Creator is everyone of us: a peoples brought to life by a force of nature we’ll never truly discover or understand, trying to both forgive life for its harshness and rebel against it. It also doesn’t hurt that science-fiction was invented by a woman (because would a man would ever write about the negative side of arrogance?). Listen, forget what they told you in high school — if you read one epic poem in your life, ditch The Iliad and The Odyssey and spring right for Milton’s tragic hero rendering of Lucifer. I know, I know, this book wouldn’t exist without Homer’s original tales, but I said what I said. Milton’s poem begins with Lucifer, an angel, banished from heaven for his questioning of God and subsequent disobedience. When he crashes to Earth he famously decides it is “better to reign in hell than serve in heaven.” He the devotes his existence to tainting God’s favorite creation — humanity — like a jealous sibling gone very, very wrong. There’s a lot going on in this poem (it’s, like, 900 pages so that’s not shocking). In Satan, Milton has created a hotly debated “hero” who is a charismatic leader, a questioning follower, a vengeful offspring, and lonely being. In Adam, we have a hapless victim who leaves the story a loser but with a hopeful that he may find for himself “a paradise within thee.” Like Frankenstein, it’s rife with existential commentary and rebellion against one’s creator. However, it takes a cosmic level to these arguments, opting out of the metaphor and straight for a direct confrontation with God that has been echoed in later work like Philip Pullman’s His Dark Materials trilogy and The CW’s Supernatural. I know, it's not a book, but the majority of us experience this play in the script form so it’s on this list. The Crucible is easily my favorite play and the bane of all high school students forced to read it. Whatever your opinions on Arthur Miller as a person, he wrote a groundbreaking play that got him on some bad lists during the time of the Red Scare in Cold War America. The Crucible follows fictionalized versions of real-life victims of the Salem Witch Trials and examines the interpersonal motivations, social status quo, and motivations that surrounded the executions of 20 people. 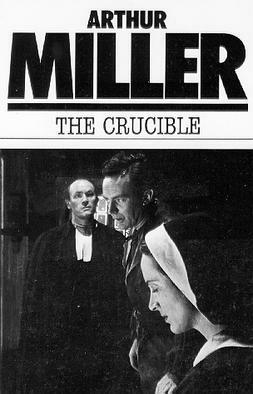 The Crucible has been an important work for me because of the ways in which it can be adapted and interpreted. It’s about finding someone to blame, something to point the finger at, and a big target to bring a frightened people together (sound familiar?). It’s a necessary read, especially for those white, lawmaking men out there who seem to think any criticism of them is a “witch hunt.” Read about the real witch hunts, and the devastating miscarriage of justice that seems to still have echoes today. For any creative (or even anyone out there who ever wanted something), this book has been on must-read lists forever. It’s a series of — you guessed it — letters written by Rainer Maria Rilke to Franz Xaver Kappus. Kappus was a future writer who, at the time, was serving at the Austrian Military Academy. The letters are mixture of self-esteem boosts as Rilke convinces the young writer-to-be to not give up on his art, and a commentary on what art should be — what it should be able to do, and what you become capable of when you give into creative freedom. It has burgeoned such famous, yet deeply personal favorite quotes as: “Perhaps all the dragons in our lives are princesses who are waiting to see us act, just once, with beauty and courage. Perhaps everything that frightens us is, in its deepest essence, something helpless that wants our love.” Poignant stuff for a world ready to turn itself inside out with Islamophobia, homophobia, misogyny, xenophobia, and a plethora of other imbecilic “fears” against our fellow human being. I’m going to cut this off here because if I don’t, I won’t stop. Which I’m fine with, but you will most certainly stop reading. The point is, at the end of the day, these are the books that shaped my mind and adulthood. It’s not a perfect list (it’s all quite western) but I’d like to think I turned out pretty okay because of it. So get out there and read the books that will change your life — or, rather, the books that make it.